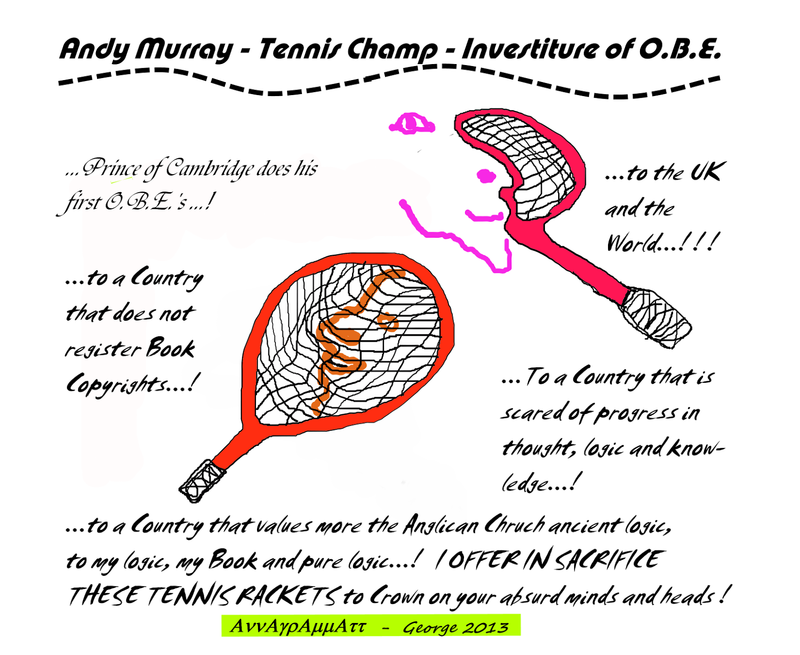 …to the UK, the World and O.B.E Andy Murray…! Wimbledon champion Andy Murray receives his Officer of the Order of the British Empire (OBE) medal from The Duke of Cambridge, during an Investiture ceremony at Buckingham Palace, London. …when shove comes to push, the first thing I think of is two[dos] broken tennis rackets, put over William’s head…! One on its edge, and one as if hitting a tennis ball…! NOW why ? Well because of all the beatitudes of the English legal system and their good hearts, in contrast, with the BUBLe LIFE of the Monarchy from reality and laboratory sicknesses and those of mother nature…! …I SUPPOSE Andy Murray, would have given a signed Tennis Racket of his and a Tennis ball…! …secondly, even and OBE, for playing ping-pong tennis, means a lot…! Because in Tennis if you slice the ball, it sinks into the ground, and if you do serves away as far as possible from the centre line you get a wider serving area…! …SO ALL THIS SHOW of TENNIS, is really more of a SHOW…! But Andy Murray, you do “run fast”, as most cannot reach the ball in a good cross court return hit…! Meaning to say, the COurts are too wide for a true tennis match…! OBE or not, I do not think Prince knows all the real ins and outs of TENNIS…! As to me, Andy and Prince William can shove it up their “asses”…! Why ? Because that is what I am worth to them and Canada and R.C.M.P…! And even if they prove me wrong, I still do not need nor want an OBE…! I would love to de-throne Richard Dawkins and Darwin and Academia of Bible Theology…! BUT BELIEVE ME, I already have, it is just a matter of time…! ! ! ← …bees, 70% of Worlds crops & diesel…!